You'll be £20.00 closer to your next £10.00 credit when you purchase Wooden Warship Construction. What's this? This book takes a selection of the best models to both describe and demonstrate the development of warship construction in all its complexity from the beginning of the 18th century to the end of wooden shipbuilding. For this purpose it reproduces a large number of model photos, all in full colour, and including many close-up and detail views. These are captioned in depth, but many are also annotated to focus attention on interesting or unusual features, which can be shown far more clearly than described. Although pictorial in emphasis, the book weaves the pictures into an authoritative text, producing an unusual and attractive form of technical history. price. This is one of the best. If you have the other two books in the series, you should add this one. It would also interest and perhaps, inspire ship modellers as well as making a good addition to any nautical library. Admiralty models have always been inspirational to artist and model makers, so this book with its illustrations can, in a way, be considered a respectable book on art. That the author uses the photos as a vehicle to explain ship building makes it even more worthy. International Journal of Maritime History, May 2018: reviewed by John McKay - Langley, British Columbia, Canada. ★★★★★ In a book so copiously illustrated, the reader expects only a brief overview of the parts and processes that follow. Incredibly, so many details are presented you can’t possibly remember them all after one reading. 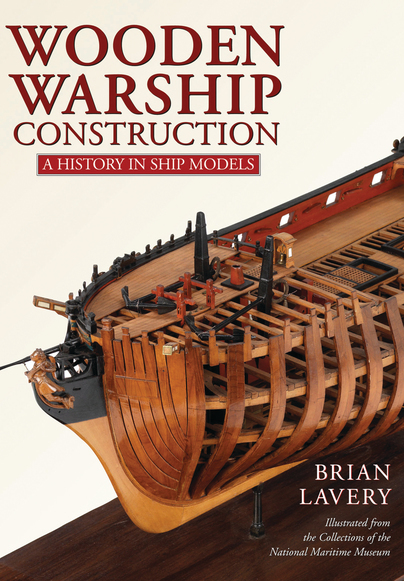 Anyone considering building an authentic wooden ship model or researching any aspect of ship construction would do well to begin with this excellent book. This is also a reference that writers and readers of fiction can consult time and again whenever their hero’s ship sustains damage. As a former curator, the author knows his way around the outstanding collections of the National Maritime Museum. – This is a well researched, beautifully produced and impeccably illustrated work that will become a standard in its field – Highly Recommended. Students of naval history will find this book invaluable for understanding how Great Britain maintained its maritime pre-eminence through the long eighteenth century, while those looking to understand and to revive ancient crafts have a comprehensive, readily intelligible, and lavishly illustrated guidebook. Secondly, the illustrations and the written text are integrated to create in print a narrative that is equal to and which often surpasses those of multimedia productions. Brian Lavery has demonstrated that the printed book is as flexible and as user-friendly a medium as the tablet and the television, but he also gives the reader an inducement to visit the museum in Greenwich or to explore its website. Brian Lavery has written 26 book on maritime history, though 'Assault Landing Craft is his first title for Seaforth Publishing. Brian is Curator Emeritus at the National Maritime Museum and is on the advisory committee of HMS Victory. He was historical advisor on the film ‘Master and Commander’ and has sailed in many vessels, from a dinghy to a square rigger.